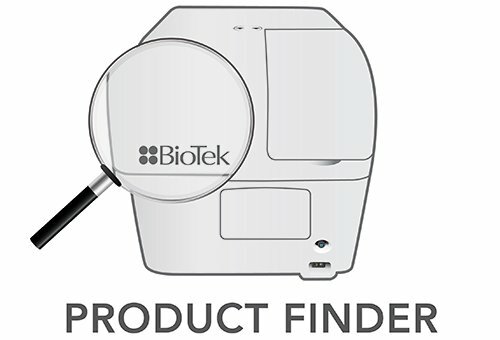 Cell-based assays based on label-free detection with SRU’s BIND® platform were prepared in 1536-well microplates using the EL406™ for the sequential dispensing of microplate coatings (fibronectin, collagen or laminin) and cells expressing the target of interest. 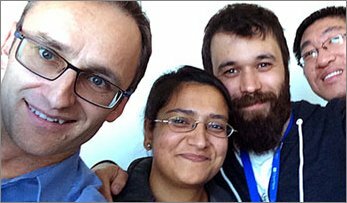 Label-free technologies are designed to monitor binding events without the need for reporter tags that can influence the kinetics and thermodynamics of the binding. Most common applications involve determining kon and koff rate constants of binding partners and thus equilibrium dissociation constants, Kd, that define the strength of binding. This is particularly useful in monoclonal antibody clone selection, where low Kd’s (or high binding affinity clones) are desired. 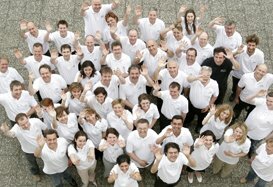 Companies such as Biacore (GE Healthcare) and ForteBio provide leading platforms for this particular application. 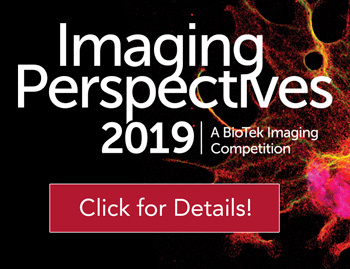 Another popular application is in cell-based assays for screening applications, where agonist binding to cell surface receptors (G Protein-coupled Receptors, Receptor Tyrosine Kinases, Ion Channels, etc.) induces changes cell morphology and/or adhesion that can be monitored by label-free technologies. 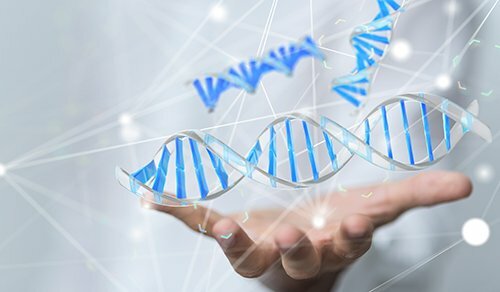 SRU Biosystems has developed the label-free BIND® platform to address screening of these popular drug targets in this manner. The BIND platform uses a novel optical effect to provide a sensitive measurement of cell adhesion in the proximity of the BIND biosensor surface. 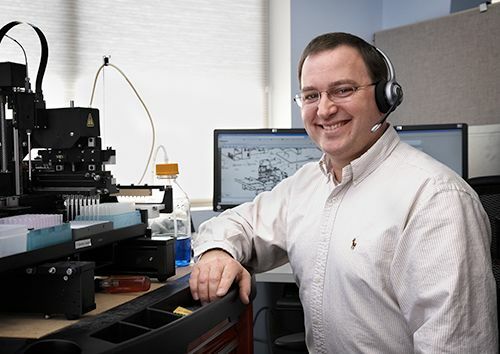 The biosensor incorporates a proprietary nano-structured optical grating that is adhered to the bottom of a variety of SBS-standard microplates of different well-densities. The grating of the BIND biosensor reflects a narrow wavelength range of light that is measured with the aid of a spectrometer. This narrow wavelength range is termed the Peak Wavelength Value (PWV). When a cell binds to the biosensor surface, the PWV increases. The difference in PWV is the BIND response that is output from the BIND reader. 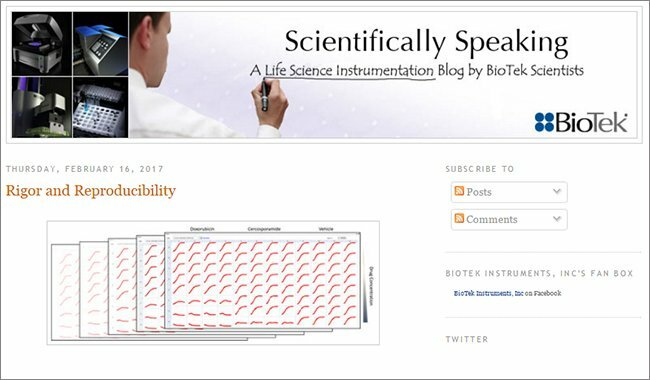 This response can be monitored kinetically, which is helpful in quantifying responses in myriad cell-based applications. 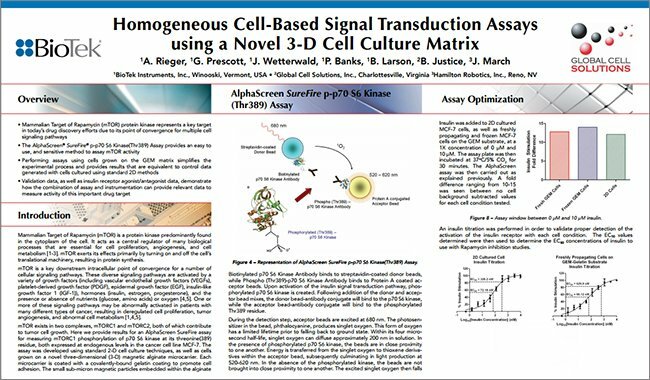 Another PWV change can occur upon agonist binding to cell surface receptors which is attributable to signal transduction pathways inducing changes in cell morphology that can be monitored by the biosensor. These BIND responses can either be an increase or decrease in PWV. Figure 2. BIND Response is a differential signal associated with a binding event. The principal driver for technology adoption in primary screening is cost followed by throughput. Assay costs/well must be low, typically ≤ $0.10/well. 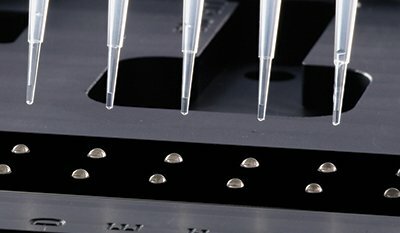 As there are no reporter tags, the principal cost associated with a cell-based, label-free assay is cells and the biosensor microplate. 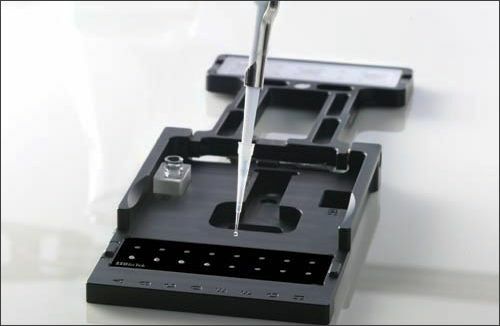 The cost of the biosensor microplate is fixed and independent of well density, thus the assay cost/well can be reduced by over an order of magnitude by using 1536-well densities relative to 96-wells and brings the BIND technology into the cost constraints of primary screening. 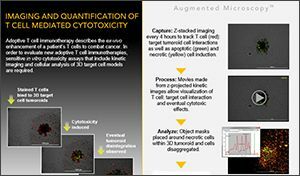 This miniaturization also serves to reduce the number of cells needed in the screen to as low as 1,000 cells/well. 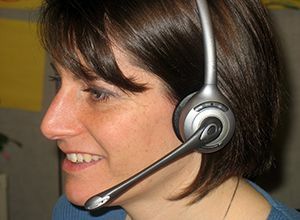 This also opens up the ability to use human primary cells, where supply is limited. of 96-, 384-, and 1536-well operation. remove excess protein through washing, add cells, and follow with gentle washing to ensure that only the cells that adhere to the biosensor remain. 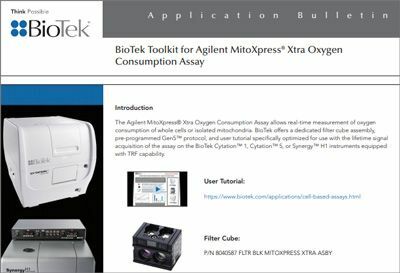 This application note will demonstrate the utility of using the EL406™ Microplate Washer Dispenser to perform these assay preparation steps and provide some validation data in a label-free, cell-based assay of a GPCR target. Figure 4. 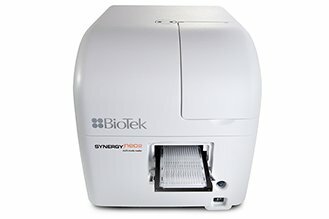 EL406™ Microplate Washer Dispenser. 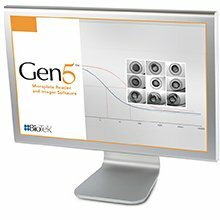 Protein extracellular matrix used to coat 1536-well biosensor microplates is readily available from many vendors, including Sigma-Aldrich. 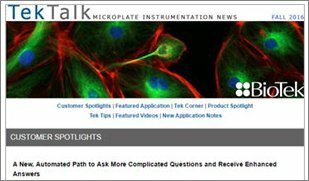 CHO-K1 and HEK-293 cell lines are similarly readily available from multiple vendors and American Type Tissue Culture. 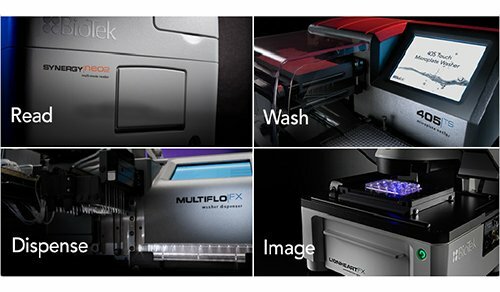 There are two different options for dispensing of fluids with the EL406™ Microplate Washer Dispenser. 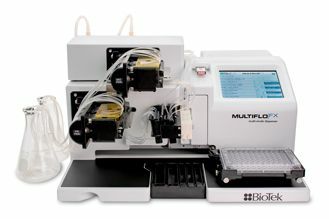 The peristaltic pump dispenser uses autoclavable tubing cassettes to pump fluid from a reservoir to 96-, 384-, and 1536-well microplates. This dispenser has the capability to dispense as low as 1 µL to the full volume of a 1536-well plate in 1 µL increments. Alternatively two separate syringe pump dispensers are also available on the EL406™, which have a lower limit of 3 µL per well. Because the fluid path for the peristaltic pump dispenser can be sterilized by autoclaving, it is more useful for the dispensing of cells than the syringe pumps. The syringe pump dispensers can be used for cell dispensing, but they require liquid sterilization procedures such as >70% ethanol exposure. For 1536-well microplates, the 1µL tubing cassettes used with the peri-pump dispenser are available with two different tip configurations. The sapphire-jeweled tip has a very small orifice which makes them work very well with homogenous solutions. The plastic molded tips have a larger opening and as such work better for cell suspensions and are less prone to clog with solutions with high protein concentrations. In regards to flow rates when using the two different 1 µL tip types, the sapphire-jeweled tips in general can be used at lower flow rates than the molded tips due to the smaller orifice resulting in higher fluid exit velocities. In either case, it is important to use a rate sufficient to propel the fluid to the bottom of the well of the 1536-well microplate. As a rule, faster rates tend to work better. Both the jeweled and plastic tip 1 µL cassettes are optimal for dispensing from 1 to 50 µL. For larger volumes, 5 and 10 µL cassettes are also available. 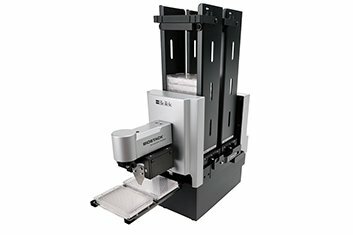 The aspiration and dispense parameters used for 1536-well microplate washing are highly plate type- and process-specific. In regards to dispense height, adjustment of the manifold height such that it is less than 1 mm above the top of the plate is critical for faithful dispensing of fluids. Likewise the aspiration height is set based on its position relative to the bottom of the well. 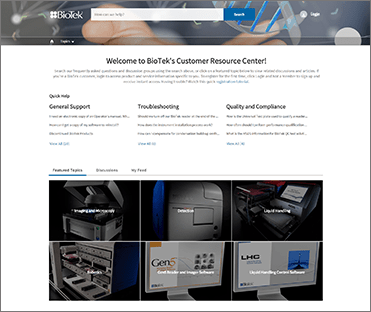 The EL406™ Microplate Washer Dispenser is controlled using an external PC running Liquid Handling Control™ (LHC) Software (BioTek Instruments). 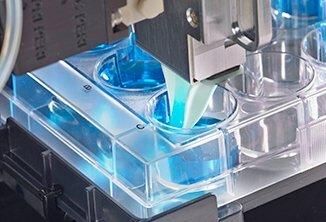 The fluid addition procedures can be accomplished using the peristaltic pump dispenser with a 1 µL cassette. Each well received 10 µL of fluid with the cassette set with a Z-axis position of 225 (10.29 mm above carrier) and both X- and Y- axis positions set to 0 (center of the well). The dispense rate should be set to “high” and the pre dispense-prime set for 2 dispenses of 10 µL/tube. 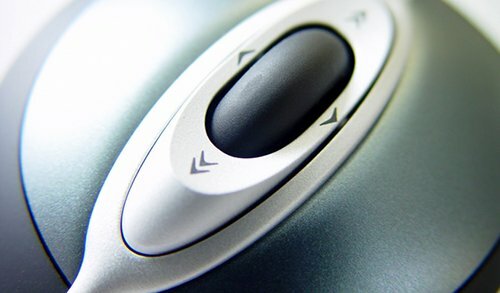 The aspiration of fluid during wash steps can be carried out using a travel rate setting of 6 CW (14.7 mm/sec) with no delay. The aspiration manifold can be positioned with a Z-axis setting of 10 (1.2 mm above carrier) and both X- and Y- axis positions set to 0 (center of the well). A syringe pump on the EL406™ was used to deliver µL amounts of protein solution suitable for providing a layer of matrix on which cells could adhere to the biosensor microplate. Figure 5 demonstrates the significant PWV shift, 200 pm < PWV shift < 1000 pm depending on protein matrix, seen with the protein matrices relative to the uncoated biosensor microplate. Figure 5. PWV shift and inter-plate reproducibility due to extracellular matrix (ECM) coating of biosensor microplates. 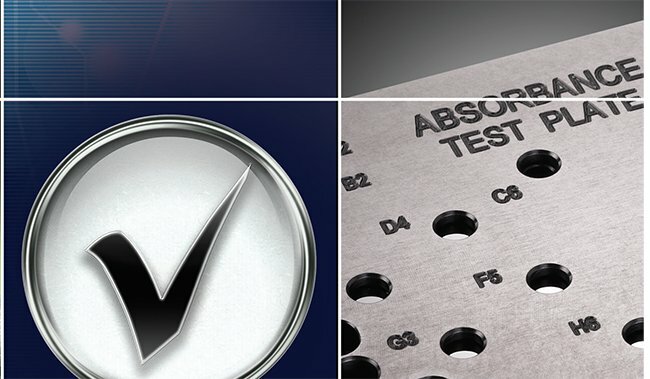 The significant increase in PWV can be used as a QA/QC test to ensure appropriate coating with protein matrix of the biosensor microplate well is achieved. Good reproducibility in PWV shift relative to uncoated is seen between different biosensor microplates. 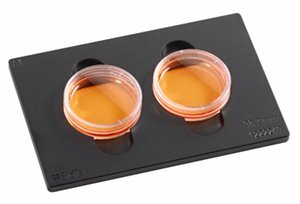 ECM coating across a plate is also an important consideration for reproducible cell-based assays. Intra-plate reproducibility was determined using the BIND SCREENER software and its ability to visualize reproducibility with the aid of heat maps. 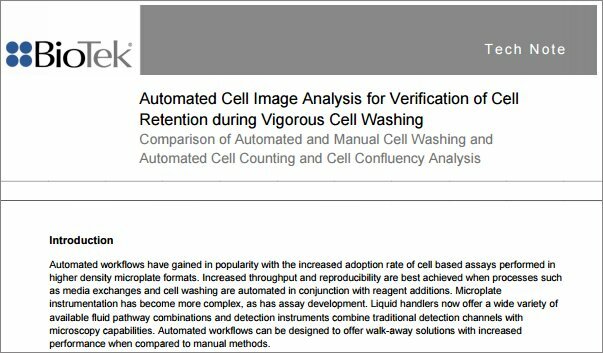 Figure 6 demonstrates the reproducibility of ECM deposition across a 1536 biosensor microplate for both EL406™ and another liquid handling device capable of dispensing into 1536-well densities. Figure 6. Heat map comparison of EL406™ and other liquid handler dispensing ECMs into 1536-well biosensor microplate and precision attributable to 384 individual wells for the ECMs fibronectin, collagen, and laminin used in this study. It is evident that EL406™ provides superior deposition precision based on PWV shift and satisfactory performance for label-free cell-based assays. The final step in label-free cell-based assay preparation is addition of the cells expressing the drug target of interest. 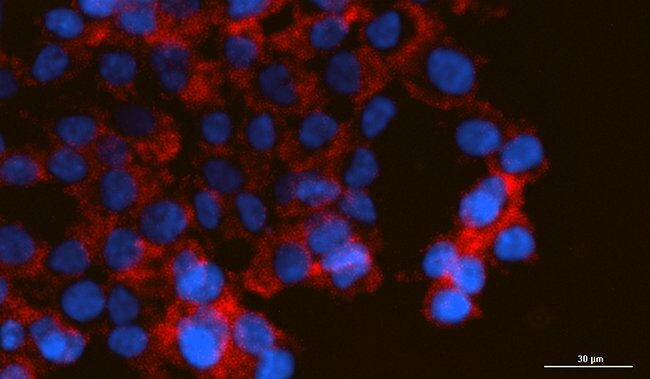 For GPCR assays, the most common cell lines used for screening purposes are CHO-K1 and HEK 293 cells. 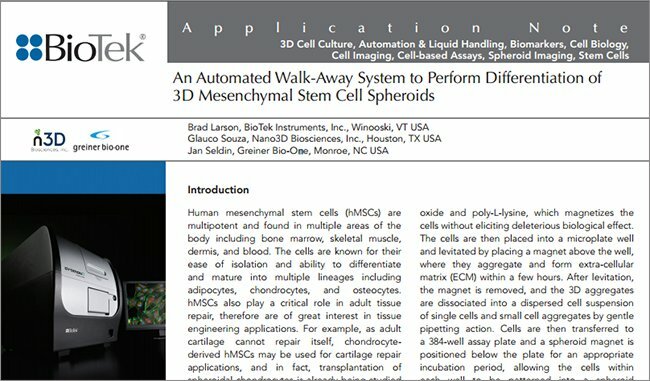 Figure 7 demonstrate PWV shift for both CHO and HEK 293 cells added to the ECM-coated wells of the 1536-well biosensor microplate. Figure 7. PWV shift from CHO and HEK 293 addition on uncoated and various ECM coated wells of a 1536-well biosensor microplate. 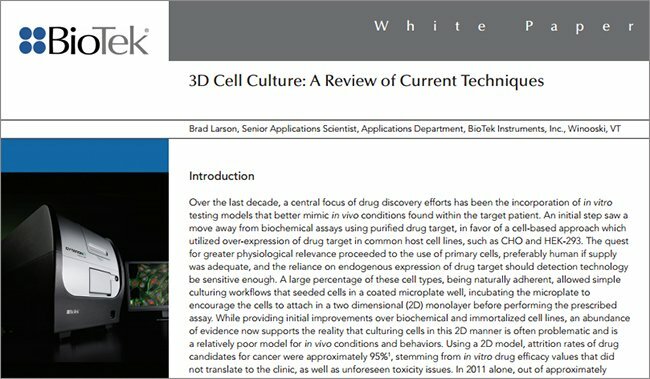 As with the ECM-coating, the addition of cells induced large PWV shifts: 300 pm < PWV shift < 1700 pm indicative of good adherence of the cells to the biosensor microplate. Large significant differences in PWV shift are seen between cell type and ECM coating. Comparisons were also made between the intra-plate reproducibility of PWV shift using EL406™ and the same liquid handler used in the ECM deposition. The table below depicts the comparisons over 384-wells for CHO deposition for fibronectin. Table 1. 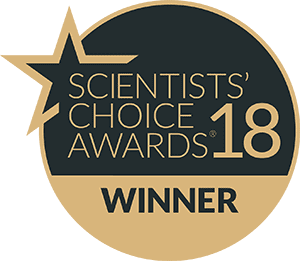 Precision comparison of EL406™ and other liquid handler dispensing CHO cells into 1536-well biosensor microplate with ECM coatings fibronectin and collagen. 384 individual wells were use to determine %CV. A significant improvement in precision is evident for CHO cell addition across the plate for the ECM’s fibronectin and collagen. 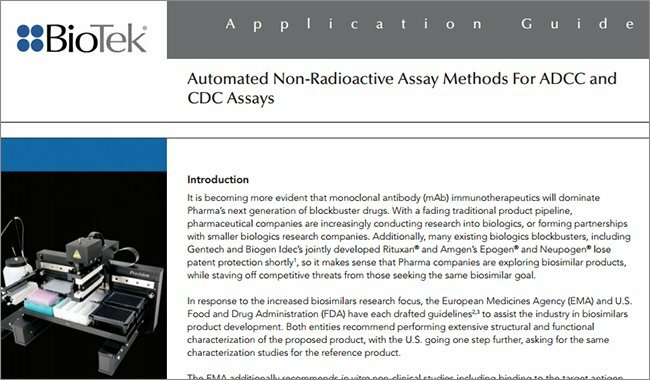 The validation of a CHO cell label-free assay prepared by ECM and CHO cell dispensing with the EL406™ was performed with ATP-dosing. Extracellular ATP acts as a general cell membrane receptor agonist leading to the stimulation of various pathways and ultimately morphological changes in adhered CHO cells that can be detected by label-free technologies, such as the BIND SCREENER as PWV shifts. Figure 8 shows the PWV shifts associated with ATP stimulation kinetically. Figure 8. Temporal response of CHO cell stimulation with saturating amounts of ATP dosing. It is apparent that the ECM fibronectin provides the maximal PWV shift response to ATP stimulation. 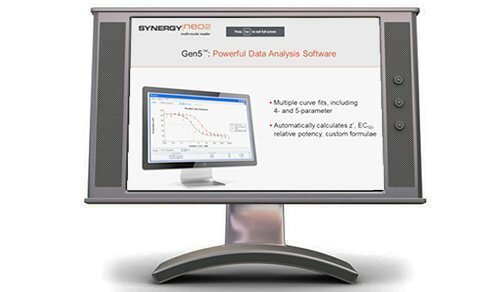 Other applications will require separate selection of cell line type and ECM for optimal performance. 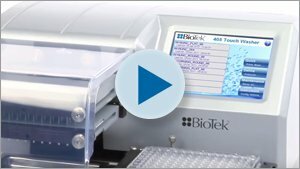 The EL406™ serves as a useful tool for the preparation of label-free, cell-based assays in a 1536-well density. Satisfactory precision is evident for both extracellular matrix deposition and adherent cells allowing for reproducible GPCR assays. 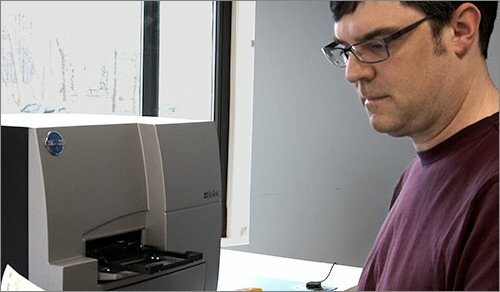 The use of 1536-well densities serves as a useful, cost-reduction measure allowing label-free assays to be used economically in primary screening applications.